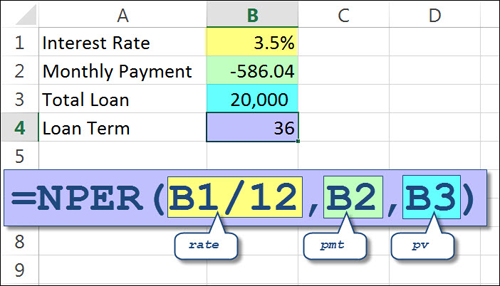 Excel Tip: Determining the Remaining Length of a Loan Using NPER » Accounting Advisors, Inc. Previously I’ve explained how you can use worksheet functions in Excel to determine the payment for a loan, as well as how to calculate total interest in a single worksheet cell. This time around I’m going to use the NPER function in Excel to show you how you can determine just how long it will take you to payoff that credit card bill on which you’re making monthly payments. As discussed in my previous article, if you have the interest rate, term, and loan amount, you can then use the PMT function to solve for the payment. Sometimes, such as with a credit card balance, you’ll know the interest rate, payment, and loan amount, but not the term. In this case, Excel’s NPER function (short for number of periods) enables you to calculate the fourth value. rate – The interest rate for the loan expressed as a monthly rate. pmt – The monthly payment, which should always be shown as a negative amount. fv – This optional argument allows you to specify a future value if a balloon amount is due at the end of the loan. Omitting this argument implicitly states that the loan is to be paid down to 0.
type – This optional argument allows you to specify if payments are made at the beginning of each period, or you can omit the argument to indicate that payments are made at the end of each period. You may also specify 0 in this position to explicitly indicate that payments are made at the end of each period. As shown in Figure 1, it will take 36 months to pay back $20,000 with a monthly payment of $586.04 at an interest rate of 3.5 percent. Always be sure that the payment is shown as a negative number, otherwise NPER may show a slightly longer payment term. I omitted the 2 optional arguments, so in this case, the PMT function assumes the loan is paid to 0 and payments are made at the end of each period. 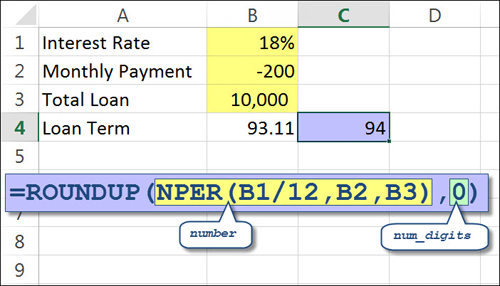 Figure 1: Use Excel’s NPER function to calculate the payment term for a loan. For longer term loans, NPER may return a large number of months, such as 94, which can be difficult to convert to months in your head. Let’s extend our calculations to make the output more user-friendly. First, as shown in Figure 2, we’ll add the ROUNDUP function to our NPER formula. Loan periods will typically involve some fraction of the final month, which for our purposes we want to treat as a whole month. The ROUNDUP function rounds a number up, as opposed to the commonly used ROUND function that may round numbers up or down. num_digits – in this case we’ll use zero, as we wish to round up to the next whole month. If you wanted to round a number to say the nearest thousand, you’d use -3 instead. Figure 2: Use the ROUNDUP function with the NPER formula to convert to months. Next, we need to convert the result that ROUNDUP/NPER return into a number of years and months. To do so, we can use the TRUNC function. This function converts a number to an integer by removing the decimal or fractional portion. You could also use ROUNDDOWN and specify zero as the number of digits to accomplish the same effect. In either case we’re taking the number of periods returned by NPER, dividing it by 12, and then truncating the decimal places. Figure 3: Use the ampersand sign to concatenate text and calculations into a logical phrase.